This Greece Travel Tips page will help you book your trip to Greece and avoid many of the problems that people e-mail me about, therefore reducing the number of desperate emails I will receive and allowing me time to do the things I truly enjoy, of which answering e-mail is not one of. 1. The earlier you book your flight the more inexpensive seats will be available. 2. When airlines are short of cash they offer discounted fares, usually in January-February so look for bargains then. 3. Automated On-line Booking sites are useful for researching hotel prices and seeing reviews from people who have actually stayed in the hotel, but they give you zero support. A reliable Greek travel agency can give you competitive prices while helping you plan your trip to make the most of your time and money. 4. Booking hotels individually means you are responsible for getting there and to do that you need reliable ferry information often before the ferry companies have even released them. With last-minute cancellation fees for popular hotels as high as 90 to 100% this is risky. 5. Hotel websites are not objective. The website will tell you the hotel is the best. A travel agency that knows the hotels will tell you the pros and cons of each. 6. Travel agents make deals with specific hotels for extra low rates in return for the promise of bookings. The rooms are paid for before the season and these are the hotels the agency will have the best prices for. 7. If you come to an agent with a specific hotel you saw that looked good on a website ask if there are hotels of the same category or better for less. 8. The most popular hotels are not always the best but they are generally the most expensive. 9. A good travel agency knows that return customers are his bread and butter and will go out of his way to make sure you are satisfied. When planning your trip express any doubts and don't be afraid to ask questions. If you have problems during your trip, whether it is dissatisfaction with your room or problems with the ferries or a change in the weather contact the agency. Part of their job is solving any problems that may occur for their clients and making sure they return home singing praises of Greece and the agency and return again and again. 11. When booking on-line a travel agency will sometimes ask you for proof that the credit card is yours by having you fax a signed photo-copy. This is to prove that you made the purchase and not someone who has your card number. It is standard procedure. 12. Beware of hustlers. 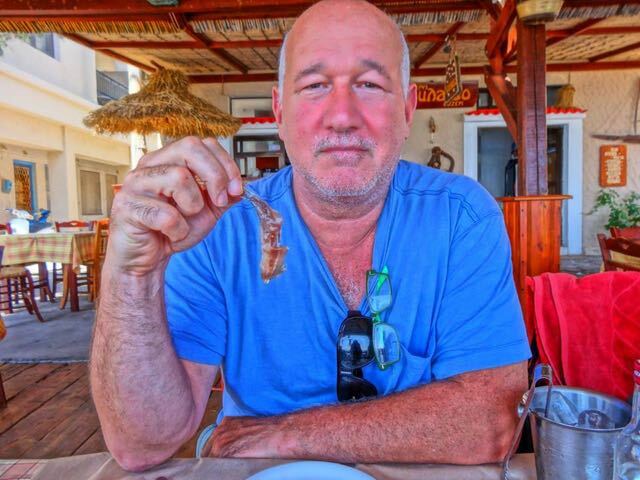 If you are booking as you go and someone approaches you on the street or in your hotel and takes you or sends you to a travel agency to buy ferry tickets to Amorgos and you walk out of the agency with five days on Mykonos and a cruise because they told you the Amorgos ferry was cancelled, then you were just hustled. That does not mean you won't have a good time. It just means someone took advantage of you. 13. You can take the metro or a taxi from your hotel to the port. The hotel concierge can arrange the taxi or point the way to the metro. 14. You can take the metro or a taxi from the port back to the hotel. There is usually a line of taxis waiting for every arriving ferry. 15. If you have an early morning flight you don't have to stay at the airport or near the airport because the roads are clear of traffic in the morning and you can be at the airport in less than half an hour by taxi. 16. Don't try to see too much. Five islands in ten days is a lot of traveling and waiting around for ferries and flights. Two islands in ten days is sensible. If you want to see a lot of islands take a cruise. 17. Packages and Programs on travel agency websites serve two purposes. They make it easy for the customer and the agent to create the itinerary because all the pieces of the puzzle are already in place. But a good travel agency excels at putting together custom itineraries that suit the individual so don't be afraid to give the agent a list of islands, a time-frame and a budget and ask them to come up with something and then don't be embarrassed if you want to fine-tune it. This is what they do. At the same time don't put an agent through hours of work and then take the itinerary to someone else and ask for a better price. This is bad karma. 18. Taxi drivers are not criminals. They are generally some of the most interesting people you will meet. There are some low-lifes among them but this is true of any profession. If you like a taxi driver tip him 10%. If you really liked him take his card and use him again. 19. A pre-arranged taxi transfer from the airport usually costs twice as much as a regular street taxi. This is because the transfer taxi is going empty to the airport to pick you up and waiting as long as it takes for you to arrive. A regular taxi is at the airport because someone paid for him to be there and someone will pay for him to go back. Plus when you have a pre-arranged taxi it is usually an English speaking, non-smoking, informative driver in a new Mercedes. 20. Greece is the safest country in Europe, Athens the safest city and women should not be worried about traveling alone. Chances are also good you will meet someone else who is also traveling alone. As for terrorism there is more of a chance that you will drown or have a heart attack in the shower than be killed by a terrorist. Not that the showers are dangerous either. 21. Travel agencies book flights and ferries as a service to their customers since there is no profit in them. If you book with an automated system or the hotel trying to save money you are pretty much on your own. You can buy economy tickets in the port usually on the day of departure unless there is a big holiday or it is August or a weekend in July. If you want a cabin, have a car or are going by highspeed it is best to book at least a week in advance. Earlier if you are going to Mykonos, Santorini or any island that you have ever heard of in the summer. 22. Most people you will come in contact with will speak English since most people you come in contact with will be waiters, hotel employees, travel agents, shop owners and people involved in the tourist trade. But even in non-touristy places the number of people who speak English is remarkable. 23. Anti-US Government is not the same as Anti-American. The Greeks love Americans. They are just not crazy about our leaders. If you like your political leaders that is fine. But it may be best not to dig in and try to convince your taxi driver of this regardless of what side of the political spectrum you come from since you probably don't know what side he comes from. I just agree with whatever the taxi driver says. If you are in a taverna drinking with friends then it is a different story. You can be passionate and they probably will too and hopefully you will still be friends later. 24. Many people who come to Greece have a profound experience, like coming home or feeling like themselves for the first time in years If this happens to you don't be surprised. It is normal and when you go home you may see life differently. Many people want to return to Greece as soon as possible. If you want to make it easy on yourself use my Create-an-itinerary Form and you can click what you want to do, how many days, what islands you want to visit, and in 24 hours you will get a suggested itinerary and a price, which you are under no obligation to buy.